Pet MatchMaker Find Me A Pet! Are you thinking about bringing a new pet into your household? Are you feeling overwhelmed especially if you're using the Internet to find your next pet? Did you know that I’m a “Pet Matchmaker?" I can help you find your next pet even from the Internet? One of the joys of my animal communication practice is helping people find the right companion animal for their family. In many ways, I’m a "Pet Matchmaker” who can help you find a new animal friend which can be joyful but overwhelming. One of the easiest ways to find your new friend is to ask for my help. I recently helped Lorie after her cat Vinnie, who suffered from chronic urinary disease, died suddenly. We both knew Murphy, who was deeply bonded with Vinnie, needed a new kitty companion. And fast! Of course, there was no replacing Vinnie. When Lorie found out Winston needed a new home, she immediately emailed me Winston’s and Murphy's pictures to make sure Winston was a purr-fect match for Murphy and her two Chihuahuas, Traci and Sophie. When I communicated with Murphy, he told me he liked Winston and would readily accept him as a friend and brother. When I described Winston’s energy to Lorie, we both agreed he would make a good match for her family. And sure enough, that's exactly what happened. Winston readily accepted Murphy, Traci and Sophie. 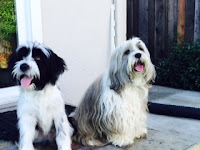 Cheryl gave me a call a couple of weeks after adopting Bandit, a 6 month old Tibetan Terrier. She wanted to make sure Tango, her 10 year old Tibetan Terrier, was OK with Bandit joining their pack. Cheryl was relieved and felt more peaceful after talking with both dogs who confirmed that they wanted to be friends and pack-mates. If you are searching the Internet for a companion animal, be very careful when choosing a new friend without meeting them in person. Sadly, people can be unscrupulous when it comes to selling/adopting pets on the Internet A client once sent me a picture of a dog from a breeder on the Internet. The picture made the hair on the back of my neck stand up. I sensed the puppy in the picture didn't exist. It turned out the picture was from a puppy mill breeder who tried to take advantage of my client's grief and excitement to get a puppy. I was happy I warned her before she lost her money and hear broken. There are many things to consider before choosing your new friend. First and foremost, it’s important you include your current animal family in the decision making process. Next, it's important you get a good idea about the new animal’s energy so you end up with an animal that easily fits into your household. Luckily, I am able to help you both. Please visit my Why Call page to learn more about how I can help you and your animal family.